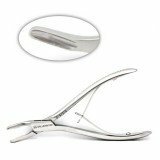 Plastic surgery rongeurs are plier-like instruments that are used in a variety of procedures, often to remove bone or tough tissues. They feature sharp edges and scoop or spoon-like jaws to help the surgeon grasp and remove the required materials. Patterns commonly used include Bane, Friedman, Hardee, and Prentis.